Things are soon gonna change around in the era of digitization. Even the mode of internet connection is gonna go for a toss with the rise in the stakes of development. 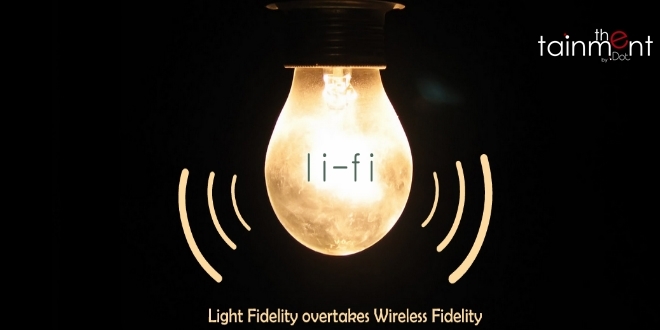 To be more accurate, Wi-Fi is going to be replaced by Li-Fi. Li-Fi is a wireless technology that transmits high-speed (insanely high-speed) data using visible light communication, or VLC. So imagine switching on a bulb in your room, and it’ll not only be a source of light, but will also transmit wireless internet to your phones and other devices. It is claimed this would lead to a revolution in the world of videos. Scientists have even taken Li-Fi out of the lab for the first time and tested it in offices and industrial environments in Tallinn, Estonia. They are claiming that they can achieve speeds of up to 1 Gb per second in a work environment. Li-Fi is 100 times faster than the average Wi-Fi speeds that we currently have around the world. “We are doing a few pilot projects within different industries where we can utilise the VLC (visible light communication) technology,” Deepak Solanki, CEO of Estonian tech company. Currently we have designed a smart lighting solution for an industrial environment where the data communication is done through light. We are also doing a pilot project with a private client where we are setting up a Li-Fi network to access the Internet in their office space”, Velmenni, told IBTimes UK. So what are its Advantages? “All we need to do is fit a small microchip to every potential illumination device and this would then combine two basic functionalities: illumination and wireless data transmission,” Haas said. “In the future we will not only have 14 billion light bulbs, we may have 14 billion Li-Fis deployed worldwide for a cleaner, greener, and even brighter future.” If this technology does pan out, and it comes to India, it would mean everyone who has an LED light bulb would have access to the internet”, he added. So what do you think of the future? Let us know in comments below! Previous articleWOW: Here’s How You Can Clean Your Lungs Easily In Just 3 Days! Next articlePM Modi Tours The World But The Travel Bills Are Still Low?